The International Cheer Union (ICU) was established on 26 April 2004 and is the recognized world governing body of Cheerleading. ICU comprises of 105 member National Cheer Federations / 3.5 million athletes on all continents, hosts World Championships consistently welcoming over 70 nations, many global continental and regional championships, and continues to grow as a unified voice for all those who are dedicated to the positive advancement of cheerleading throughout the world. Following a positive vote by the SportAccord General Assembly on 31 May 2013 in Saint Petersburg, the International Cheer Union (ICU) became SportAccord's 109th member, and SportAccord's 93rd international sports federation to join the international sports family. In accordance with the SportAccord statutes, the ICU is confirmed as the world governing body of Cheerleading and the authority on all matters related to it. The ICU is also a proud member of TAFISA (The Association For International Sports for All), is WADA Code compliant, and is fully applied to the International Olympic Committee (IOC) to further promote the advancement of Cheer around the world. 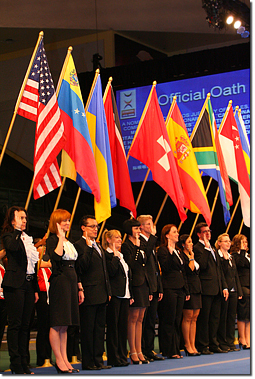 Many individuals and organizations from a large number of countries have contributed to the principles and ideals embodied in the International Cheer Union. The ICU is structured to provide balanced input and governance based on the various stages of development in which cheerleading finds itself across the globe. It serves as a powerful advocate for those who are truly dedicated to the advancement of cheerleading, and especially for the young athletes who participate, and with this mission- has trained athletes, coaches and judges in over 85 nations to date. The ICU is a non-profit international governing entity, and it has been properly and legally registered as such. Its mission and purpose are strictly to advance the sport. No corporations or individuals will benefit financially from it. ICU’s statutes are approved by SportAccord, adopted by the ICU General Assembly, and ICU is a fully democratic International Sports Federation. A Governing Council of the ICU represents the various geographic areas where cheerleading exists. Individuals who represent specific countries and who have experience in our sport are eligible for positions on the Council, as well as to be considered for assignment to various committees that are currently being formed. The ICU continues to accept membership applications from National Cheer Federations (also known as National Governing Bodies for Sport Cheer) from all countries around the World. Countries that do not have an established National Cheer Federation, the ICU may provide general recommendations and assist with the process as much as possible. However, each nation generally has some of its own specific requirements to be officially recognized. The ICU appreciates very much the contributions all international organizations and federations have made to the development of cheerleading in their countries. The ICU works closely with them all on this exciting endeavor. The Sport of Cheer is an Athletic, Independent Sport with a Long, Innovative History!